Tag line: "IT'S ALL AMERICA'S CHOICE FOR ALL-OUT FUN!" 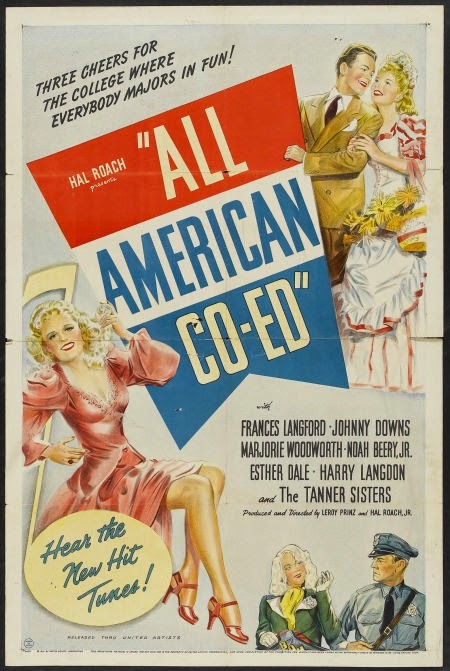 Trivia: This film marked the first credited screen performance of actor Alan Hale, Jr.
As a publicity stunt, the all-girls Agricultural College Mar Brynn, on the advice of their press agent (Harry Langdon), decides to offer scholarships to a dozen beautiful women, all of whom will then participate in a musical pageant. What they don’t know is that the fraternity of a rival school plans to disrupt the proceedings by dressing one of their members (Johnny Downs) up as a woman and entering him for consideration of one of the scholarships. Sure enough, this imposter is chosen, but before carrying out his diabolical plan, he falls in love with Virginia (Frances Langford), the pretty niece of Mar Brynn’s President (Esther Dale). All-American Co-Ed is a fairly unspectacular film, with musical numbers that aren’t particularly memorable and a story that isn’t all that funny. In fact, the best thing about the movie is its cast and crew. Director LeRoy Prinz previously worked as a choreographer, and was nominated three times for an Academy Award for Best Dance Direction (including two nominations in 1936 for All the King’s Horses and The Big Broadcast of 1936). In addition, Hal Roach, Jr., whose father was responsible for bringing comedians like Harold Lloyd and Laurel & Hardy to the big screen, helped write the story; while prolific composer Edward Ward handled the film’s score (and received an Academy award nomination for his troubles). Not to be outdone, the cast of All-American Co-Ed also has a few recognizable names, including silent comedian Harry Langdon (in one of his last roles) and Alan Hale Jr., future Captain of the S.S. Minnow in ‘60s television show Gilligan’s Island, in what would be his first credited screen appearance. Aside from these two, All-American Co-Ed features Kent Rogers, who, up to that point, had worked primarily in cartoons, providing the voices for such well-known characters as Woody Woodpecker and Looney Tunes’ Beaky Buzzard. Rogers even got to show off his vocal talents in this movie, impersonating a number of celebrities (though, in my opinion, his Gary Cooper left something to be desired). So even if All-American Co-Ed falls short as a musical / comedy, its prolific cast and crew make it, at the very least, a cinematic curiosity.